The 2013 RideSouth Signature Ride is March 23-24. Last month, Doug Morgan joined me in another pre-ride scouting trip to check out the roads. We took along the trusty Contour camera so you can get an idea of the Signature Ride experience. Click on the pic below and let it begin! Launching from the RideSouth shop, you can see the embedded maps and elevation profiles along the way, highlighting turns and climbs. See the rest stops and excellent road conditions and feel the exhilarating descents! Get chased by a fun-loving herd of young cows just south of New Hebron and see Llama Land on the Longleaf Trace where you can dance with the emus! The weather for our trip was perfect. 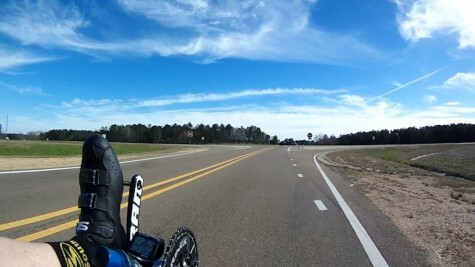 The skyline in the video as we rode into Prentiss was worthy of memory. In fact, the Signature Ride might just be your favorite ride, too! If you are already signed up, preview your experience with us. If you haven’t signed up yet, see what treats you are in for when you join us! Here is the sign-up form so you can reaffirm that RideSouth IS The Way to Ride!